“Ethics is knowing the difference between what you have a right to do and what is right to do.” – Potter Stewart. The mandate given to the newly constituted executive management of the NSE post-Ndi Okereke-Onyuike was to develop, grow and implement an exchange driven by, and able to hold itself to the best possible standards of governance and to exercise extreme caution where any appearance of or circumstance may present itself. The exchange has been executing this mandate without incident till Friday, August 17, 2018 when it supervised the launch of a private foundation of the CEO at its office, including organizing a bell ringing session; an activity hitherto reserved for departing CEOs. This is an isolated case but one that indicates acquiescence, if not support from the NSE Council – the mandate keepers. Mr Oscar Onyema is thoughtful, professional and a gentleman who has every right to pursue socially uplifting causes. It is a good thing to do but not sufficient to meet the highest standards of corporate governance; in so far as he holds the position of the CEO of the exchange. I believe that this was an honest mistake devoid of ulterior motives yet has however thrown up obvious conflicts arising from the use of the exchange in the launch and promotion of the foundation. The related issues, impact and implications arising therefrom and related to now forms the subject of this memo to the market. That said, when it comes to how and what Oscar Onyema, the NSE Council and indeed the foundation should decide next on this matter, sovereignty over decision-making does not rest with commentators and independent analysts like me; they rarely do. It will be one in which the parties will have to make in the best interest of the market – as they wish to be remembered. It is my expectation that pedigree, intent and value orientation(s) will kick in and corrective action will be taken to make this a non-issue. Market operators know the story of Ndi Okereke-Onyiuke’s 2008 outing under the aegis of “Africans for Obama Campaign”, the fund-raising that followed, and the ensuing governance issues raised concerning the director-general’s role and that of the Nigerian Stock Exchange (NSE) as an institution. Students of Nigerian corporate governance history will equally recall that Ndi’s mistake here was to repeat the May 2005 act by then President Obasanjo to invite and receive donations into the Olusegun Obasanjo Presidential Library (OOPL) project which was launched in Abeokuta with the goal of raising N7 billion for the project, while he was still in office. It would appear that the Nigerian Stock Exchange hasn’t grasped that history lesson fully. Instead, the exchange seems to be acting out the same script, the consequence of which would indicate sadly that there is no institutional memory or sustained desire to elevate the governance environment in our markets beyond where it bottomed out. To “mobilise and sensitise Africans about the Obama policies and message”, Ndi Okereke-Onyuike, OON, then Director-General/CEO of the Nigeria Stock Exchange in 2008 organized and caused to be held an August 11, 2008 glamorous fundraiser where business leaders and high-society elites paid up for tables. This generated a whole lot of heat and enquiry for which she was cleared of any wrongdoing because no Nigerian laws were broken. That said, the fact that US laws prohibited overseas donations ab-initio made the purpose, positioning and promotion of the fundraiser and the associated role of the exchange a continuing corporate governance concern, especially on matters bothering on conflict of interest and of roles. To demonstrate and deepen democracy in Nigeria, then President Obasanjo initiated and caused to be incorporated on November 12, 2002 the Olusegun Obasanjo Presidential Library Foundation and subsequently held a fundraiser on Saturday, May 14, 2005 for the said presidential library. Donors to this project included oil companies, financial institutions, business leaders and high-society elite. The referenced saga above exemplifies Oscar’s predicament with the launch on Friday, August 17, 2018 at the Exchange, of the ONO Foundation, which for all intents and purpose speaks to our common humanity and response to the plea for private sector leaders to play a structured role in helping to build a better society. Babatunde Folawiyo, a well-regarded business leader and chairman, board of trustees, ONO Foundation, echoed the message from Oscar Onyema when he said “the foundation is borne out of an understanding that the society of our dreams cannot materialize if its future (the children and the youth) are not properly trained, inspired and equipped to be the catalyst and springboard of change and growth”. The reasoning for the foundation is not a problem and should not be a subject of a debate. The issue however is with the launch signaling, timing, linkage to the exchange and role of the principal progenitor in current status. It is all about corporate governance which according to Advocate Johan Myburgh “is not a matter of right or wrong; it is more nuanced than that.” The nuance is exemplified in the optics. This was an Oscar Onyema who was the CEO of the NSE but decided to seat for the exams of the Chartered Institute of Stockbrokers (CIS), passed and thus conferred esteem upon the practice members. He is, and has always been committed to market best practice and this is the threshold with which the current optics is being viewed. The deployment of socially uplifting projects in pursuit of the common good seldom succeed when deployed under a cloud of ethical and governance challenges. Instead of saluting Oscar however for the launch as he did it, we may unfortunately end up seeing him as a conspicuous victim here of his own good track record to date on the subject of best practice and higher standards corporate governance. There must be a more cogent explanation for the role of the exchange beyond rules, conventions and privileges given what we know of the man and his service pedigree. I am not aware of any known case of any wrongdoing against the CEO but believe that the elimination of ‘incestuous relationships’ is critical to the functioning of the exchange CEO in the discharge of the CEO’s responsibilities. 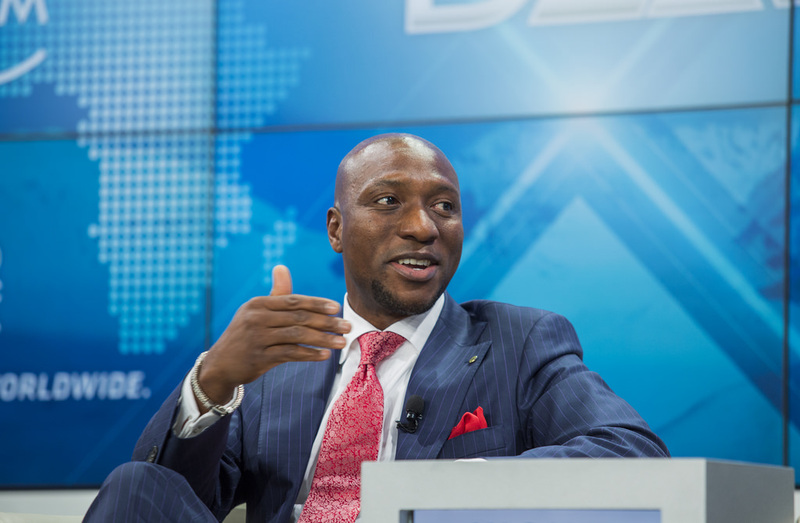 Oscar N. Onyema OON is the CEO of the Nigerian Stock Exchange (NSE), a position he was employed to on 4 April 2011; and for which he is currently serving a second five-year term. He has over twenty years working experience in the United States of America‘s financial markets and the Nigerian information technology sector. Onyema is also the Chairman of the Central Securities Clearing System (CSCS) Plc, a fellow and member of the Governing Council of the Chartered Institute of Stockbrokers of Nigeria (CIS), the President of the African Securities Exchanges Association (ASEA), a Global Agenda Council member of the World Economic Forum (WEF), member of the Board of Trustees of the Investors’ Protection Fund (IPF), and he serves on the boards of all subsidiaries of The Exchange, National Pension Commission of Nigeria, FMDQ OTC PLC. In his work coverage, he had served as the senior vice president and chief administrative officer at American Stock Exchange (Amex), which he joined in 2001 and has the unique distinction of being the first person of colour to hold that position, and was instrumental in integrating the Amex equity business into the New York Stock Exchange (NYSE) Euronext equity business after the latter’s acquisition of Amex in 2008. He then managed the NYSE Amex equity trading business, which he helped position as a premier market for small and mid-cap securities. Oscar, an alumnus of Harvard Business School where he completed the Advanced Management Program, is no slouch and he knows his onions. It is this level of responsibility, engagement and exposure that defines minimum expectations and professional conduct which makes it all the more baffling why he would allow his name to be associated with, or involved in the implied, if not apparent conflict of role situation, the launch of the Oscar N. Onyema Foundation (ONO) at the premises of the exchange presents. The Nigerian Stock Exchange (as a self-regulatory organization), has done a lot of work in the areas of corporate governance and has adopted best practices as a key element in achieving its vision and mission. This is well articulated and demonstrated by its governing board – the National Council of the Exchange – who regards corporate governance as fundamentally important to the discharge of its responsibilities and its conduct in all its dealings with its stakeholders. It would thus stand to reason therefore that any appearance of conflict will be an issue to be addressed under risks associated with the executive committee’s mandate. This Friday escapade and the questions it threw up, ought to have been an issue which the governing council ought to have addressed its minds to prior to the event; and immediately afterwards vis-à-vis the obvious corporate governance implications arising therefrom, in a clime like ours and at a time like this; especially when juxtaposed against our recent history of an incestuous relationship-biased regulatory environment, and the steps needed to restore confidence in the financial market system, nay the capital market. The fact that, three or more years after, the board of the Securities & Exchange Commission (SEC) of Nigeria has not been officially constituted illuminates actions taken by a SRO operating in a governance challenged environment more clearly. Taking together, a common view of the ONO foundation profile the existence or implied infusion of a real or perceived conflict of interest or/and role situation on face value; at the minimum. An attempt to articulate and decouple the two roles the CEO of the exchange seeks to play here is both a matter of precedence and corporate governance ethos at the exchange. As an employee of the exchange, was there a need for, and was a request made, and an approval granted by the Council of the Exchange. Was there an approval for the CEO to serve as a trustee and board member of a privately funded foundation named after him? Would having a foundation bearing his name and having some aspects of its objects similar to undertaking by the exchange’s CSR plan have led to a consequential review of best efforts (including for example the mentoring program)? Did the council consider it fit and proper to approve the hosting of a bell ringing session for the CEO, an otherwise revered activity reserved as a sending-off gesture by the exchange for deserving executives; especially when such administrative approvals were vested in the CEO (the beneficiary in this case)? Is it an allowable practice for a serving CEO to hold a board/trustee position in a private entity (including an NGO with related parties on board) while in office? Are there provisions for handling co-board positions with directly related party(ies) of a listed entity in the code and are there waivers for this? The exchange’s CEO where such a proposition presents itself? Any member with direct or indirect dealings with the exchange? The elimination of safeguards or wall between the exchange and the foundation? What advisory will the NSE provide to firms who approach it seeking guidance in deciding which social cause (CSR) is priority to the exchange between NSE’s CSR activities (corporate cancer funding, schools program etc) and the ONO foundation’s programs? Would the duplicitous representation not serve to convey and deliver an “unintended consequence” on stakeholders involved with the exchange, who would feel the pressure and compulsion to “support” the CEO’s foundation as part of ‘good relationship management? Would such support contributions not qualify as in-kind benefits or/and possibly a vehicle for the inducement of a principal officer of the exchange? Under what circumstance is such a practice allowable for other executive committee members who may also be so motivated to pursue such socially beneficial cause(s)? A review of these possible scenarios and best practice cases guided us to reaching a position, if not a conclusion – that this was a bad precedence and one that the market and principals need to work together on by elevating thought to resolve along the lines of institution building. Nigerians have since risen up and humiliated their political class over its handling of financial conduct, and particularly of the level of impairment evident in the regulators ability to rise above the numerous incestuous relationships they are often cluttered with. Indeed and sadly, the generality of the public have come to accept and see nothing terribly unusual about their sense of powerlessness and alienation from the responsibility imperative of regulators, which it has been proven collectively, brought us to the state where we felt a wholesome change was need in our markets in 2010. If we cannot change behaviour at the level of the sovereign, we can at least do this effectively at the level of industry and thus help provide teachable lessons for the development of the culture required to raise governance standards in the country and create a veritable example for listed entities. This is one of such unique opportunities. Moving on from here would require more than compliance with existing rules, conventions, laws and statutes – it requires setting new standards beyond rules to help us untangle roles and relationships. Conflict of interest is difficult to define, yet it often appears obvious to many people who think they know it when they see it. If ever there was an issue that captures this sentiment, this foundation launch offers us an opportunity to discuss the grey areas inherent in our codes and how we should walk through them. The legal definition of conflict of interest, usually set out in conventions, rules and laws governing non-profit entities and indeed SRO’s, is very specific and covers relatively few situations. Most conflicts fall into the ‘grey area’ where ethics and public perception are more relevant than statutes or precedents. For this purpose, conflict of interest is therefore placed in the background to raise the much informed argument about the ‘conflict of roles’ which arises whenever the personal or professional responsibilities of a market-based entity and board member appear to be potentially at odds with the best interests and objectives of the market as a fair and level playing space. Conflict arising from related parties and entanglement. It is obvious that there is so much to unpack here. I must however crave the markets indulgence to draw a close on this memo on the premise established – i.e. that the appearance of a conflict of interest is a minimum criteria for council oversight in the affairs of the NSE. Olufemi Awoyemi is the Founder and Chief Executive Officer of Proshare Nigeria Limited.